I’ve been quiet lately, as using an elliptical isn’t terribly interesting to write about. The only good thing I can say about it, is that I am catching up on my Battlestar Gallactica episodes. If I continue with how I have been watching them – Watch a couple, don’t for several months – repeat.. — Then I should have the series completed by the time my daughter gets married, and she is only 8! As for the title of the blog posting. I have been continuing to research how various people have “cured” plantar faciitis. Mine is better than it was, but has moved to a slow gradual improvement, rather than the quick improvement of the first few days. I have returned to wearing my Vibram Five Fingers as all of my other shoes actually bothered the PF more after those first couple of days were passed. I have it taped, using the instructions my doctor’s office gave me. The picture to the right shows the taping method that I used but with one difference.. Before doing the taping in the picture, the ball of my foot is taped by wrapping it all the way around my foot. This has been WONDERFUL as far as reducing the pressure on the plantar facia. I am also continuing to use my footlog. I use it before I get out of bed in the morning, and right before I get in bed at night – by sitting on the side of my bed and rolling my foot. Then I slowly stand up and roll it with progressively more pressure on it – until I am putting as much as I can while still standing on the other foot. I also continue to use The Stick on my calf muscles a couple of times a day, hitting the area the trigger point was (it is much less now,) but not for extended periods of time thanks to Maureen’s wonderful advice! As far as exercises, I have been stretching it by standing on a stair with the forefoot on it, while lowering my heel and holding it – which stretches the plantar facia as well as my Achilles tendon/calf muscles. I hold it for about 10 seconds, then switch legs (even though only one is bothering me, it can’t hurt right?) I do this about 5 times per leg, and do the whole set at least twice a day. 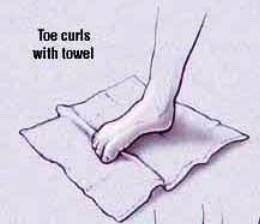 At night, I have a towel I toss flat on the ground, and then with my foot flat – I use my toes to pull it toward me. Online I have seen suggestions of picking up a pencil or marbles with your toes – I suspect it is the same sort of exercise, but the towel requires less coordination.. In my case, that is a good thing. I am also doing foot circles, with my leg pointed straight out and rotating one way, then the other. I do this twice a day.. Well, I remember at least once a day – and sometimes do it twice. I also continue to take the naproxen, although I remember only about once a day, instead of the twice a day I am supposed to take it. There is still soreness there, especially on the days I walk or stand a lot – but it does seem to be improving. I have 10 days until I am supposed to do a 1/2 marathon – so that isn’t looking all that likely.